If you’re searching the best covering solution for your window or want to transform your conservatory into a comfortable living space, then look no further and browse our wide range of high quality window blinds. 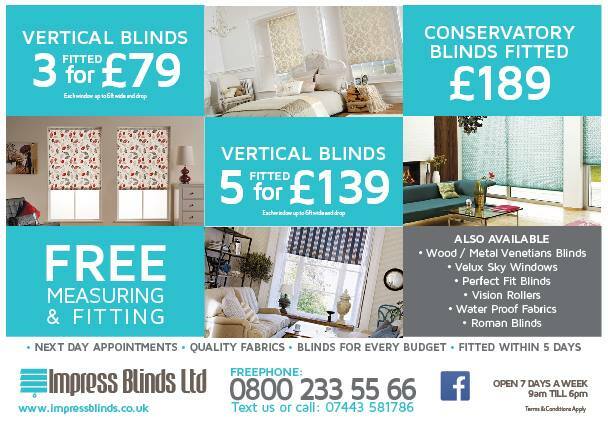 Impress Blinds carries and supplies a wide collection of superb and high quality window blinds in Wigan (UK). We’re proud on serving and helping the people by transforming their space into relaxing one with the addition of our superb and made to measure blinds. Our uniquely designed and practical window blinds can add a beautiful and sleek finishing to any project. So, we will provide you the window blinds or covering solutions that will be a perfect y addition to your home or commercial premises. Ranging from classic wood blinds to vertical blinds, roller blinds, black-out roller blinds, Velux blinds, vision blinds to modern sheer vertical blinds, Impress Blinds has a huge variety of colors, designs, texture and styles. So, here you can find exactly the right blinds for your office, home or commercial premises. Our high quality window blinds are easy to maintain and clean Thanks to our fine quality material, cheap window blinds prices and quality services, we’re the leading window blinds provider in Wigan (UK). Moreover, we also offer free consultation, measurement and installation services in Wigan. This is why we have thousands of happy and satisfied clients throughout Wigan. 3 roller blinds for £119 with multiple colour options.